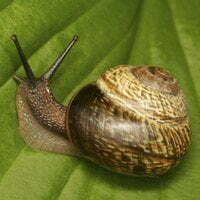 Slugs and snails can be quite damaging to both ornamental and edible plants. Here’s what you need to know to keep slugs and snails under control in your garden. 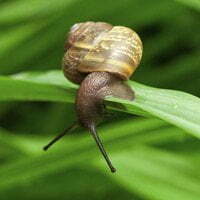 Slugs and snails are one of the most difficult garden pests to control. Because they’re hermaphrodites (both male and female), they can all lay dozens of eggs up to six times a year. Extensive slug damage to hosta plant. Adults: To find slugs or snails, look after dark, before dawn, or on cloudy days. Check underneath plants, on the bottoms of boards and rocks, and on low growing foliage, especially in shady areas. Eggs: Look for colorless eggs, about the size of a BB, in clusters under dirt clods or on the underside of large leaves near the crown of plants. Egg laying occurs during warm months, especially in the fall. Damage: Slug damage is apparent in irregular chewed out spots on leaves. Plants: Slugs are especially fond of lush or succulent plants like basil, beans, cabbage, citrus trees, dahlias, hostas, lettuce, and strawberries. Trails: Slugs and snails secrete a mucous that lubricates surfaces to help them crawl, then dries to a silvery trail. If you’re not sure what’s causing damage to your plants, this secretion is a telltale sign of slug or snail activity. Organic slug and snail bait made with iron phosphate. Abrasive Barriers: Discourage snails and slugs by surrounding planting beds (or individual plants) with a scratchy, slug deterrent barrier. Popular barriers include gravel, crushed eggshells, coarse sand, cedar chips, wood ashes, lime (if your yard needs it), and diatomaceous earth. 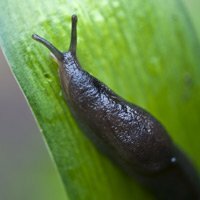 Eliminate any slugs that might be trapped inside the barrier and reapply after wet weather. Commercial Baits: A variety of slug and snail baits and poisons are available, but most of them – such as metaldehyde – are highly toxic to humans and pets. For a safer solution, look for baits made of iron phosphate. Scatter baits evenly in slug prone areas in the early evening after watering. Copper: Thought to repel snails by giving them a mild electrical shock, copper foil or flashing can be wrapped around the bottoms of planters, edges of raised beds, and plant trunks; or as rings around low growing plants. When standing flashing vertically, bury it a few inches in the soil to prevent slugs from burrowing under. You can also paint a band of copper sulfate on the trunks of susceptible plants. Eliminate Hiding Places: Slugs and snails are notorious for hanging around the undersides of boards, branches, rocks, decks and ground covers. Eliminate as many of these hiding places as you can, and use others as targets for your traps and baits. Hand Removal: Handpicking and destroying slugs and snails is one of your best defenses. Wear gloves or use chopsticks to make the job easier, or flick the pests into a container of soapy water. Water your garden thoroughly before handpicking to draw the critters out, and destroy any eggs you find. Homemade Traps: Attract slugs by putting boards, wet newspapers, cabbage leaves, or citrus or melon rinds upside down around the garden. Check back the next morning and destroy the slugs and snails that have gathered. Another popular homemade trap involves sinking a vertical sided bowl or jar in the ground and baiting it with beer. Homemade traps aren’t particularly effective at getting rid of slugs or snails over large areas, so you’ll probably need multiple traps and applications. Keep Soil and Plants Dry: Slugs lay eggs in moist soil and around damp plants. Increasing air circulation and reducing watering can help discourage the pests. Mulch Carefully: Keep mulch several inches away from the crown of plants. Don’t pile mulch directly against plant trunks, and limit it to a few inches thick. Natural predators: In fenced areas, a few ducks, chickens, or geese will happily help keep your slug and snail problem under control! If that’s not practical, try introducing beneficial nematodes or decollate snails (Rumina decollata) to your garden as natural predators. Sharp Barriers: Line the edges of raised beds with hardware cloth cut to extend over the edges in a slug deterring, spiky border. Solarize Soil: Covering the ground with clear plastic for a couple of months in summer will kill everything, including hibernating slugs and eggs, other pests, and weed seeds. Till or Cultivate: Turning the soil in early spring will help kill hibernating slugs and their eggs. It can also bring the pests to the surface where birds, frogs, and snakes can snack on them. Trim Low Growing Plants: Low branches, and plants that rest against fences or walls, should be trimmed so that they don’t touch the surface. Water Carefully: Rather than overhead watering, which gets everything wet, consider drip irrigation or soaker hoses to target water just on plant roots. We always got rid of slugs by sprinkling salt on them. want to get rid of slugs. Just put a little container of beer about a half inch high. the Slugs will be attracted to the beer . Go into container and drowned. When I lived in So Cal, I had a lot of snails in my yard. I used fireplace ashes to rid my beds of snails. Apparently, the ash causes a chemical reaction that kills the snails, and there is no worry about pets getting into chemical bait.